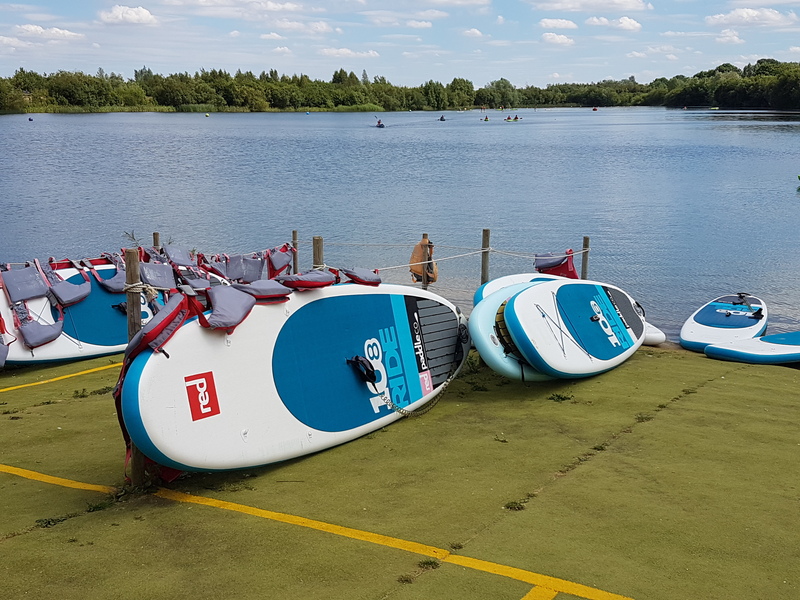 Ryan and I headed to the Cotswold Water Park last weekend to try out stand up paddle boarding on one of their lakes, we chose the facilities provided by Cotswold Water Park Hire, but there are many companies offering this and other water activities across the park. There’s also an inland beach and water obstacle course, and BBQ rental. The majority of the activities are first come first served and you don’t need to prebook but I’d recommend it if you’re going as a larger group, just in case. Cotswold Water Park Hire is based at lake 86, near the Gateway information centre and cafe, and the Cotswold Go Outdoor store. There is free parking both at the lake and the cafe as well, and the Cotswold Hire site also provides free lockers to store lose belongings. 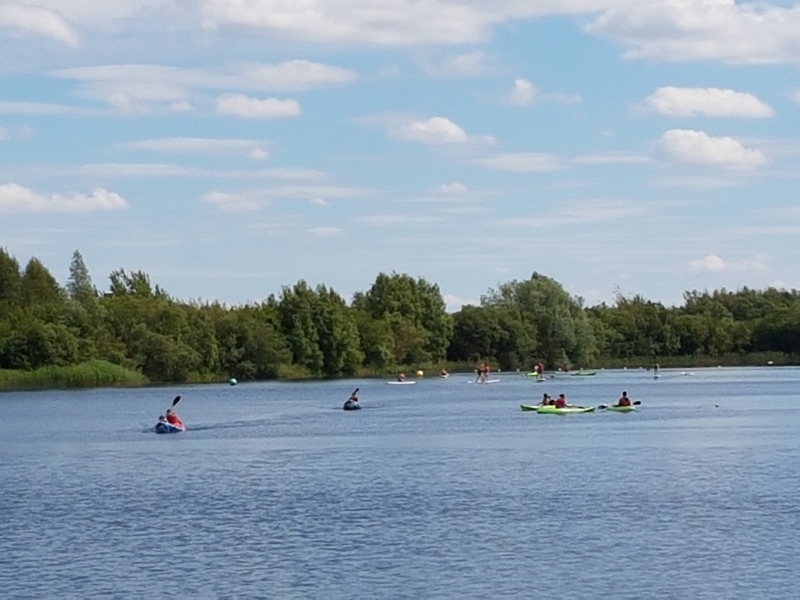 Cotswold Water Park Hire offer a range of activities such as paddle boarding, canoes, rowing boats, kayaks and swimming, there is also a picnic area on site. We’ve made a note to give the canoes a try in the near future! The staff were very friendly and knowledgeable, we got fitted with our life jackets and had a brief introduction to the boards including which way round they should face and the correct way to hold the paddle. This was followed by a demonstration on going from a kneeling position to standing up on the boards and how to fasten the ankle strap which keep you connected. We started off on our knees and our instructor pushed us out into the lake, then we were on our own! We stayed on our knees for a while getting used to paddling and how to turn. I found turning difficult at first and kept paddling on the wrong side of the board but soon got the hang of it, Ryan stood up on his board first and I followed. I’m proud to say neither of us fell in once! Although there were a few wobbly moments but we just went back to our knees and recovered. The water was quite warm and we were told we could dismount from our boards and swim in the lake if we wanted. We didn’t as we were concerned I’d lose my glasses (!) but we did sit on our boards and dipped our toes in. This will be another thing to look at in the future… Any suggestions? Prescription goggles maybe? Stand up paddle boarding is an excellent way to get in shape and have fun at the same time, and what’s great is you don’t feel like you’re working out. The scenery was beautiful and the whole experience was very tranquil. We’re definitely going to go paddle boarding again! Have you ever been paddle boarding or done any other water sports? Would you try it? Amazing place to do SUPing! Thanks! It was a great day out.